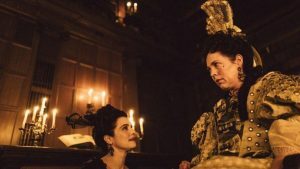 The Favourite; that’s exactly what it is for me—an immediate favourite. Yorgos Lanthimos’ 2018 film is an 18th-century period dramedy set during the reign of Queen Anne. It follows the twisted, maniacal battle between two cousins desperate for the self-conscious Queen’s love and attention. It keeps you on the edge of your seat with dashes of intensity, manipulation, and downright hilarity. The cast is an excellent mix of talent with Olivia Colman at the forefront as Queen Anne. Best known for her work in British television series like Peep Show, Broadchurch, and The Night Manager, Colman’s performance as Queen Anne garnered her critical acclaim and the Golden Globe Award for Best Actress in a Motion Picture Comedy or Musical. Her portrayal as the frazzled, emotionally unstable Queen is subtle where it needs to be, dark and intense at other points, and overall convincingly frustrating. Alongside Colman are Emma Stone as Abigail Masham and Rachel Weisz as Duchess of Marlborough, Sarah Churchill. Both actresses are brilliant in portraying the two opposing points of contention in the film’s triad. They each bring different energies to the screen; Stone plays Masham as sweet with a manipulative edge and Weisz portrays Churchill as a strong, stubborn, calculating character. Their dynamic is the source of most of the tension in the film and they do a great job of pulling the audience right into the emotion with them. The costuming and makeup throughout the film only further enhance the impressive acting. There’s a stark contrast of appearances with Queen Anne as she spends most of the film clad in a nightgown due to being unwell. When she is forced to attend public or political engagements, she is done up in lavish, intricate gowns, with delicate hairstyles and makeup. Colman’s acting gives the audience the vibe of a toddler who’s been forced to dress up for a family party. I found Queen Anne’s self-deprecation and self-consciousness throughout the film extremely relatable, especially in these extravagant costumes and settings. It reminded me a lot of feeling uncomfortably overdressed for something I didn’t even want to attend to begin with. The composition of the film, at first take, can be summed up as weird, random, and hilarious. True to Lanthimos’ style, it is an eclectic mix of high-emotion scenes peppered with subtle jokes and awkwardness, arranged in such a way that it weaves together a delightful yet daunting narrative. Seemingly random scenes— like a room full of done-up Whigs racing ducks in a grand hall or having a food fight—only add to the whimsical, slightly bizarre feel to the film. The film is based off of real people, since all the main characters depicted in the film did exist—Sarah Churchill is an ancestor of Diana, Princess of Wales and Sir Winston Churchill. However, it isn’t particularly based in reality and doesn’t follow the rigidity of needing to be historically accurate. The timeline works, the feud between the cousins was well documented, and many of the broad details hold true but are often worked to fit the narrative of the film. Considering the film overall, I don’t think it needs to be 100 percent historically accurate. It works as a story based off of real-life events and because of the acting, dialogue, and impressive production of the film, it becomes more about who the characters are on screen and what they make the audience feel, regardless of the existing history. The Favourite is an excellent film and if I’m not able to convince you, perhaps its 10 Oscar nominations can do so on my behalf.